For the most well known brands like Shark, Bissell and O-Cedar, shop here for the best steam mops! Messy buckets of floor cleaner and squeeze mops make dirty work worse. To help, you can trade that old string mop for a steam mop that sanitizes floors with less dripping, sloshing and mess. Cleaning is also easier with a steam mop, and you can use washable microfiber pads and other bells and whistles like extra cleaning attachments, detachable steamers and swivel heads that get under cabinets and clean corners. Consequently, homeowners love using a steam mop to steam clean with the help of integrated water reservoirs. Keep in mind one caveat to save your floors from damage. Ensure your floor is sealed well, to avoid allowing moisture to destroy everything underfoot. This caution is especially necessary for hardwood, as the warranties from manufacturers may become void due to the use of a steam mop. Also, use as little steam as needed on your floors while cleaning, ensure they dry quickly before you steam mop again. Many of these options are available in very light weights so that they are easy to use. In addition, others also offer a wide variety of accessories so that you can clean in a number of different ways. Furthermore, you'll have a few options with regard to the steam control styles and levels so make sure you choose the one that suits you best. For sealed floors, the Bissel PowerFresh offers a convenient way to deep-clean using antimicrobial microfiber cleaning pads. You'll be able to get nooks and crevices cleaned, as well as grimy grout and more! Consequently, whether you have marble, tile, linoleum, stone, laminate, sealed hardwood or just about any other hard floors, the PowerFresh is sure to make quick work of your cleaning jobs. Like for laminate flooring product, this Bissell steam mop also offers fantastic features like a built-in scrubber on the mop head, three settings for variable steam control and fragrance discs to keep things smelling fresh. In addition, it's designed with a lightweight 6-pound body for great levels of maneuverability and a swivel head to clean hard-to-reach areas. The Bissell's long 23-foot power cord will also allow you to clean all over without having to move to a new outlet. Amazon reviewers have particularly loved that the heater warmup takes no time at all, meaning in around 30 seconds owners can get to steaming quickly after turning on the mop. It is also a good idea to make sure you use distilled water in the PowerFresh for the best results. Furthermore, you'll find that the microfiber pads that come with this device are excellent for caked-on grime and easy to wash when you're finished. While most have loved the PowerFresh, some have found that some of the plastic parts can be somewhat cheap, resulting in the water tank being more prone to leaks due to the cap. Others find that they wish it were designed better for hanging up. However, there is a convenient two-year warranty to help ensure any problems are solved. In conclusion, this fantastic mop comes in purple and blue coloring, and offers a flexible cleaning head and an easy-to-fill tank for convenience. In some cases, there can be situations where this mop can break after just a few uses. As a result, this can create frustration for customers. Floors dry quickly after use. Works on a variety of flooring types. Some customers have experienced it leaving streaks. For those who want something affordable, effective and easy to use, this is a fantastic option. If you have larger swaths of dirty, sealed flooring then you can rely on the Shark Genius Steam Pocket Mop to get the job done fast. This steam mop is fantastic on larger jobs due to the wider cleaning zone it offers. You'll also be able to release dirty pads so that you can attach a fresh, new pad with the press of a single button. Due to the help of that Touch-free technology, you'll have an easy time getting rid of dirty cleaning pads and attaching fresh ones. In addition, the Shark Genius is able to clean away stubborn stuck-on grime using a steam blaster. Due to the 22-foot power cord, you'll also be able to get across large floors without having to find new outlets. Because of the three-level steam control, you'll be able to engage in direct-steam channeling to make sure it gets where you need it. On the Shark Genius, you'll also find dual-sided cleaning pads that can help with cleaning up or using it as a scrubber as needed. At a mere 6 pounds, you'll also find that this device is light and easy to use for scrubbing up just about any of the messes around your home. Overall, the Shark Genius has been highly praised by owners who find it to be a more effective tool than other steam cleaners. The triangular cleaning pad design also makes it perfect for corners and the cleaning pads are easy to change. You'll also get a one-year warranty to ensure you'll have the support you need. Make sure that you assemble the mop well and make sure it's in good condition, because in some cases it can break after just a few uses. Makes mopping a lot easier. In some cases there can be unexplained breakages after only a few uses. If you have a lot of area to cover and need something that can keep up, this is a great choice! The Bissell Symphony All-In-One Steam Mop and Vacuum is able to steam hard floors and vacuum, allowing you to do the jobs of two appliances with just one. It also includes multiple microfiber mop pads that are best used on sealed floors. These four cleaning pads also include some that allow you to get a deeper clean through the use of scrubbing strips. Furthermore, many owners find that the Symphony is able to heat up in about 30 seconds, allowing it to quickly produce steam for cleaning up after pets, kids and spilled food. If you need it, there is also a carpet glider you can buy separately. Because the Symphony is a dual function machine, it weighs in at a little under 10 pounds, which is a little heavier than other steam mops. In addition, you'll have the use of a 25-foot power cord and easy-to-use digital controls that allow you to set the two-level steam control as needed. The Symphony is also ideal for families, as it's great for cleaning up after tracked in mud and pet shedding. You'll also be able to easily convert between the fantastic functions, allowing you to get the benefits of a vacuum and steam mop in one tool. As a result, you can move between sweeping floors and breaking out the steam mop without a problem. With this level of versatility, you can enjoy vacuum and steam mop functions that non-combo units simply cannot offer. You'll also get a two-year warranty to keep you in safe hands. On some rare occasions, customers have found that it can stop being able to create steam. Because of that, it may require repairs after a few months. In some cases it can stop producing steam without apparent cause. Some customers find it to be poorly made. This device offers you a vacuum and a steam mop in one, creating a higher level of versatility as a result. If you need a tool that works not only as a great steam mop, but also as a grout cleaner, window squeegee, detail brush, fabric steamer or offer a great deep clean, the PowerFresh Lift-Off Pet Steam Mop is the choice for you. This lift-off cleaner is a highly versatile device that works great on sealed flooring. In addition, it includes around a dozen attachments to make cleaning easier. While you can expect this to be one of the heavier models at around 10 pounds, it has a variety of add-ons that can make your job a lot easier. Another benefit it offers is that it comes with an integrated scrubber, much like the Bissell Powerfresh original. As a result, it offers more power to tougher spots that need a good scrubbing. Alongside the longer 25-foot power cord, you'll also get washable microfiber pads and scent discs that can leave your home fresh-smelling clean. In about 30 seconds, this steam mop is also able to heat up quickly so that you can get to work on your floors. Furthermore, Amazon reviewers are big fans of this device and the two-year warranty that comes with it. However, owners who use this device can sometimes find that it has a small fill hole, and also isn't removable, which can make it difficult to get water into the water chamber. Some customers have experienced problems with this mop arriving in a nonworking condition or ceasing to work with no apparent reason. Comes with a number of attachments. May arrive in nonworking condition. If you have pets or children that you need to easily clean up after, this is a wonderful choice. For sealed floors such as linoleum, hardwood, ceramic, laminate and wood-look tile, the inexpensive O-Cedar Microfiber Steam Mop is one of the best options. Compared to competitors, this is a very budget-friendly option that is still highly capable on most hard floors. Many find that this device works similarly to the Bissell or the Shark Lift-Away vacuum line. The O-Cedar includes some quality features like a snap-on glider and variable steam control so that you can scrub hard or lightly steam carpets as needed. Users also love that this mop is able to heat up in about 20 seconds and be able to produce steam, which is great when you have grimy floors and not much time to clean them. Due to the attached scrubber, you'll have no problem maneuvering and using this 5 pound tool. 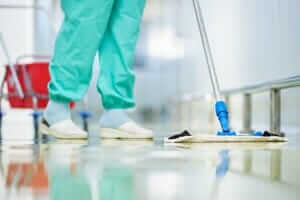 Owners of the O-Cedar find that the included scrubber pad does a great job when it comes to getting squeaky clean floors. While a few customers do find that O-Cedar to be somewhat flimsy, it does also include a great one-year warranty to help give you the support you need. This device can get clogged by minerals and sometimes stop producing steam as a result. In some cases, it can get clogged. Some units can cease working without cause. For getting clean floors without breaking the bank, the O-Cedar is the way to go! If you're looking for a steam mop that also features a removable hand-held steamer that you can use for curtains, counters and other above-floor surfaces for a truly deep clean, the Shark Lift-Away Steam Pocket Mop is a great option. Like the Bissell models, the Shark is also able to heat up in just 30 seconds and produce steam. In addition, it shares the feature of washable microfiber cleaning pads with the Bissell PowerFresh. Furthermore, you'll get a 25-foot power cord to give you all the distance you need and a flat scrubber tool that is also made with a pad, designed for handheld use. In addition, at a mere 5 pounds, you'll easily be able to leave your floors spotless without extra weight or the hassle that can come with traditional mopping. The Shark Lift-Away also provides a quick-release mop head, steam-control settings and two mop pads for convenient use. Owners particularly love the accessory hose and garment steamer brush that help to create a higher level of versatility. It is recommended that you use distilled water with the Shark Lift-Away for better results, especially if you need to scrub pockets of hidden grime well. This mop is also best used on sealed floors. Some customers have found the Shark to have a smaller water tank, which can mean you need to refill it more often. However, it also includes a one-year warranty that can ensure you that the manufacturer really supports this device. Make sure you be careful with the mop as well as any additional cleaning tools it comes with to make sure your surfaces won't be damaged by them. Some customers find it hard to control the mop and the steam button. In some cases, some of the accessories can leave scratches on certain surfaces. For something lightweight that uses the power of steam to get your surfaces clean, you can't go wrong with this mop. The Shark Genius system is a great option for those with larger areas of flooring that they need to get clean. If you're looking for a new device to replace your old mop, you'll be able to switch to this one without too much of an extra cost. You'll also get multiple pads, allowing you to get a fresh cleaning pad whenever you need. Using a small lever that you can press with your foot, you'll be able to replace or switch out the pad as needed. Furthermore, you'll be able to flip the pad over to the back side and use the folded-over Genius pad to finish getting your floors clean. Consequently, whether you need to click in a fresh pad or flip the one you're using, you'll be able to do it without touching the pads with your hands. The Shark Genius Pocket Mop is a device that is absolutely made for convenience, offering a strong ease of use and the flexibility to flip the head as needed, even moving the head backward in order to get the job done. Though it's similar to the PowerFresh, this mop does offer an added versatility and ability on sticky stains. Overall, the Shark Genius Pocket Mop can get your floors cleaner faster while taking no time at all to warm up and get hot. A great steam mop for larger jobs, the Shark Genius Pocket Mop is not only effective, but also easy to shimmy the head out to replace or switch the pad. Because that helps to avoid the spread of germs to your hands, it's a safer option as well. The handle on this mop may be less durable than other options, causing it to sometimes break unexpectedly as a result. Great for tile and hardwood floors. Makes light cleaning much simpler. Some customers find the handle to be flimsy. In some cases, it doesn’t get hot enough to complete the task. For larger spaces that need to be cleaned, this system is a great way to get the job done.